Explore the numerous day-trip ideas around Brisbane: Surfers Paradise (SkyPoint Climb, Infinity Attraction, & more), Oxenford (Warner Bros. Movie World & Wet'n'Wild Gold Coast) and Sea World Theme Park (in Main Beach). Pack the 8th (Tue) with family-friendly diversions at Dreamworld. Spend the 30th (Wed) exploring nature at Glass House Mountains National Park. The adventure continues: let the kids burn off some steam at South Bank Parklands, take in nature's colorful creations at City Botanic Gardens, take some stellar pictures from Mount Coot-tha Lookout, and get to know the resident critters at Australia Zoo. To see reviews, ratings, where to stay, and more tourist information, you can read our Brisbane trip planning tool . If you are flying in from India, the closest major airports are Brisbane International Airport and Gold Coast Airport. 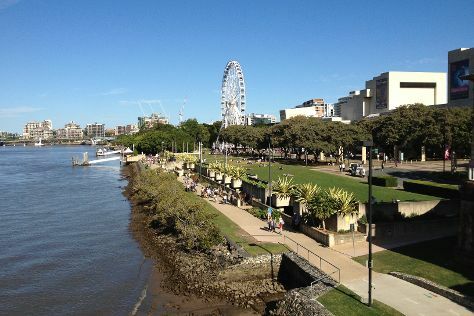 October in Brisbane sees daily highs of 29°C and lows of 19°C at night. Finish your sightseeing early on the 31st (Thu) to allow enough time to travel back home.